Napa High sophomore Tyler Oda controls the ball against James Logan's Brahjon Thompson on Tuesday night in Union City. Napa High sophomore Brock Bowers sprints upcourt ahead of James Logan's Malcolm Steadman on Tuesday night in Union City. Napa High senior Zach Swim (25) drives in front of James Logan's Gabriel Hawkins on Tuesday night in Union City. Napa High sophomore Brock Bowers passes the ball over James Logan's Malcolm Steadman on Tuesday night in Union City. James Logan senior Brett Thompson, hidden, tries to keep Napa High senior Zach Swim, left, from handing off to sophomore Tyler Oda during Tuesday night's playoff game in Union City. Napa High head coach Zack Cook celebrates a fourth-quarter basket by the Grizzlies during Tuesday night's playoff game at James Logan in Union City. Napa High seniors Vince O'Kelley (23) and Zach Swim shoulder-bump after being introduced before Tuesday night's playoff game at James Logan in Union City. Napa High seniors Zach Swim, left, and Stephen Blume console each other during the fourth quarter of Tuesday night's playoff game at James Logan. UNION CITY — After rolling through the Vine Valley Athletic League with a spotless 12-0 mark, the Napa High boys basketball team was looking for its first playoff win since 2001, in its first playoff game since 2005. Unfortunately for the 14th-seeded Grizzlies, they are still looking for that victory. Third-seeded James Logan bulled its way to an 85-76 home victory in the first round of the CIF North Coast Section Div. 1 playoffs Tuesday night. The Grizzlies (23-6) trailed for all but 65 seconds in the contest, taking their final lead on a 10-foot pull-up jumper from Tyler Oda with 1:48 left in the opening frame. A Brayden Greenlee basket with 1:28 left in the third cut the Napa deficit to 55-52, but Logan’s Daniel Combs sank a trey to move it back to six on the ensuing possession. The Grizzlies closed it to 58-56 when Zach Swim used a strong post move to score 34 seconds into the fourth quarter. 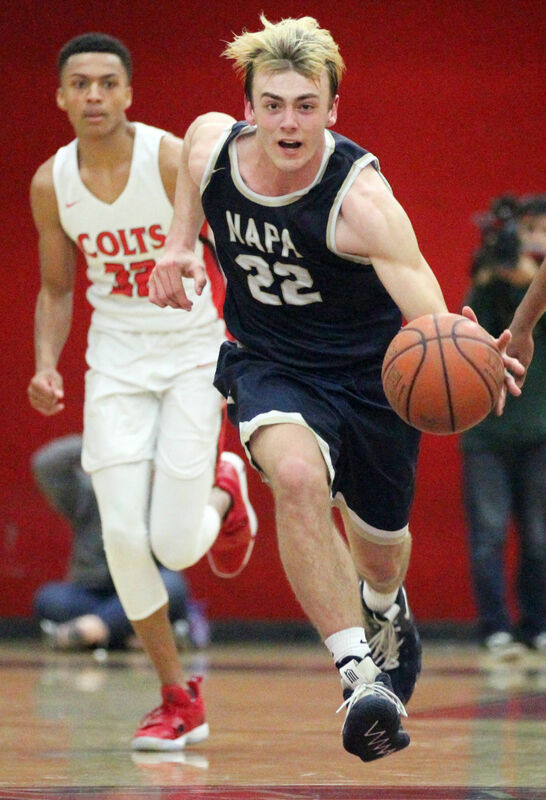 But the Colts (22-5) responded with a three-point play with 6:37 left in regulation, and Napa never got closer than five the rest of the way. Brock Bowers was nearly unstoppable in the early going, the sophomore putting up eight points in the first period and seven more in the second to keep the Grizzlies within striking distance, but Napa never could maintain a lead. Bowers finished with a team-high 24 points, with Swim pouring in 22 and Stephen Blume adding 12. Greenlee chipped in seven, Oda had six, and senior Vince O’Kelley added five. After a back-and-forth first eight minutes, the Colts pushed the lead to nine just 30 seconds into the second frame on a bucket by Brett Thompson, who led all scorers with 26 points. A 6-0 Napa run highlighted by an Oda-to-Bowers connection in the paint trimmed the lead to 26-23 with just under five minutes left in the first half. But the Colts drained consecutive 3-pointers and a pair of free throws to go up 34-23 one minute later. Swim scored the next four points and Greenlee sank a 15-foot jumper from the left baseline to close the gap to 40-35 at the break. Swim put up seven points in the second period as he and Bowers combined for 23 points in the first half. But Logan pulled away late by hitting nine of 11 free throws in the fourth period. “They played gutsy all year,” Cook said of Swim and Bowers. “They are our best players, our posts.